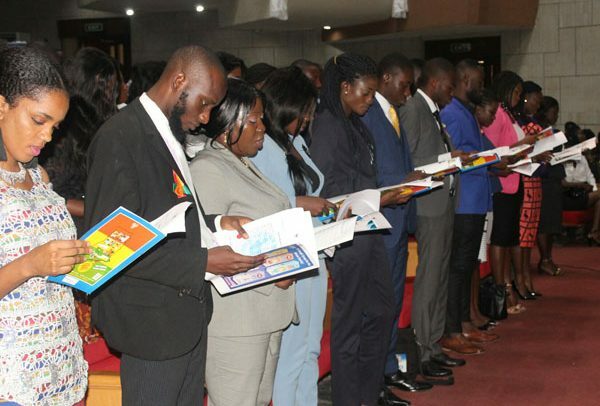 The first batch of home-grown professional doctorate graduates in pharmacy (Pham.D) have been inducted by the Pharmacy Council of Ghana (PCG). The Pharm.D graduates, numbering 136, formed part of a total of 280 newly qualified and registered pharmacists who successfully completed their licensing exams in 2017 and 2018. Out of the total, 155 were trained at the KNUST, Kumasi, 41 from the University of Ghana, School of Pharmacy, 76 from Central University and eight from different universities abroad. The Registrar of the Pharmacy Council, Pharm. Audu Rauf, explained that although the Bachelor of Pharmacy (BPharm) curriculum was good at its inception, particularly with the sound scientific principles in the programme, it is gradually running out of relevance to emerging pharmacy needs. He, therefore, observed that the introduction of the Pharm.D programme would better meet the current and future needs of Ghana in healthcare delivery. The Deputy Minister of Health, Kingsley Aboagye-Gyedu, speaking on behalf of the sector minister, said the roles of pharmacist have evolved globally in sync with the training of pharmacists to work in multi-professional teams. He, therefore, expressed his pleasure at the step taken by the country to upgrade from BPharm to Pharm.D. He urged the pharmacists to put the skills they have acquired to provide preventive and promotive healthcare services to the community. Dr. Anarfi Asamoah-Baah, Retired Deputy Director-General, WHO, in his address as the special guest speaking on the theme for the ceremony, ‘Universal Health Coverage: The role of Pharmacy Education’, stressed the need for healthcare professionals to champion health for all. He said Universal Health Coverage (UHC) is about total well-being of people, including disease prevention, health promotion and mental health. “Our health system was designed to deal with acute episodic illness yet the future health needs of the country are chronic and may need long term and health facilities that can manage those illnesses,” he said. Dr. Asamoah-Baah, thus, urged the inductees to be the change makers in the changing healthcare system of the country. Pharm. Lawrence Oppong-Anokye of Komfo Anokye Teaching Hospital, Kumasi, took the Pharmacy Council 2018 Preceptor of The Year Awards sponsored by Tobinco Pharmaceuticals. Dr. Emmanuel Kwabena Appiagyei was awarded The John Ocran Award for emerging the overall best student candidate in the 2017 qualifying exams. He took home the Pharmacy Practice Award for the same year. Dr. Belinda Danso won the John Ocran Award and the Pharmacy Practice Award for 2018. Josephine Amponsem Boateng was adjudged the best student for Law and Ethics in 2017 while Dr. Zenobia Yormekpe won the award for 2018.